It is time for another edition of Book Talk Thursday! I now have a three year old who thinks she is a princess and LOVES her fairy tales. I love fairy tales too, and I really enjoy the different versions of them. But sometimes I really love the silly ones too. So, on yet another snow day, I found a fun fairy tale that even my nine year old son will love: Rapunzel and the Seven Dwarfs: A Maynard Moose Tale! In the book, Maynard Moose tells the story of "Punzel" in his own way. Of course, she still has the long hair and has to let it down to get her food and for the prince to get her. But, the prince keeps asking her at times when something else happens, and he gets hit with things like a pear and a chair. Plus, he is too fat to get up the tower. When she finally gets out of the tower, she meets the seven dwarfs and goes home with them. Things get crazy at this point. They end up shaving her hair because it keeps getting caught in the trees. Then the Snow White story takes over. Though the book has horrible, horrible grammar, it will make children laugh out loud! The book would actually be perfect for teaching context clues because Maynard Moose makes up some funny words that the students could figure out the meanings. There is a Moose glossary in the book, which helps for students to understand the meanings of the words. If you can get past the horrible grammar, it is the perfect book for making kids laugh and use their context clues. 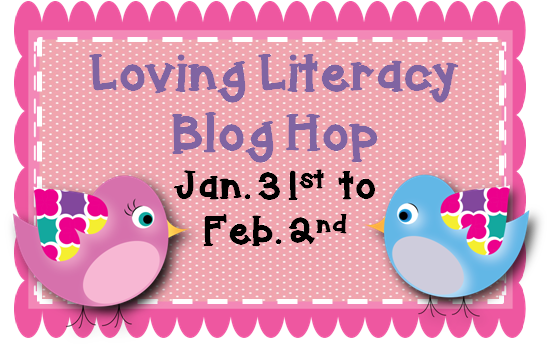 And don't forget to hop on over tomorrow morning beginning at 8 AM to grab a fun freebie plus many more in the Loving Literacy blog hop. I love Maynard Moose - especially The Uglified Ducky - I don't even read it - I just get the copy with the CD because I love listening to it so much!! What a great book to share - thanks! I haven't read The Uglified Ducky, but I will definitely be looking into it! I have actually heard this one on Tumblebooks too, and it was hilarious to hear the "moose" read the story! Thanks so much for stopping by!